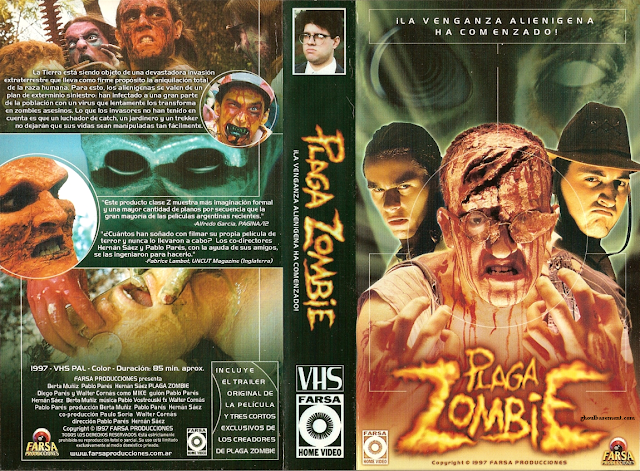 2000 limited edition VHS, also includes Plaga zombie trailer, short: "The Skeleton and I", short: "Yourrrrrrrrrrrrrr...", short: "The Friends of the Devil"
In other tidbits, check out my interview/contest entry over at Zombies DON'T Run, under Mr. Horror Blogosphere Entry #21. Voting starts today, and even though I will not win since BoGD gave up on HorrorBlips (*dig*), I'd appreciate any votes this blog receives from you guys! Also you probably didn't notice, but this entry is a little late for a weekday. My parents bought an LG BD-550 Blu-ray player and wanted me to hook it up; so I was over there for a few hours. Expect some thoughts on this just released budget unit tomorrow.